Published Apr 16, 2013 by Peachpit Press. What is your InDesign-to-EPUB workflow? Best practices tips from Liz Castro about creating epubs from InDesign, including what adjustments you can and should make to your ePubs by hand to get the best results. Is fixed layout EPUB here to stay? A concise critique of the fixed layout EPUB format, what it is best used for and some thoughts on the future of the format. Do you have any tips about creating mobi files? Converting an EPUB to a Mobi file for Kindle can be simple with the right tools. What are the challenges around fonts in ebooks? This video segment includes coverage of licensing issues, encryption, and how fonts will look on different devices. What is the role of the index in ebooks? A brief discussion of the possibilitites of interactitivity to add value to your ePUBs. What emerging ebook technologies excite you? What updates do you have for us after HTML5 and CSS3 Visual QuickStart Guide and ePub Straight to the Point went to press? What other tips do you have for people producing ebooks? Find out Liz's fundamental advice for producers of EPUBs. 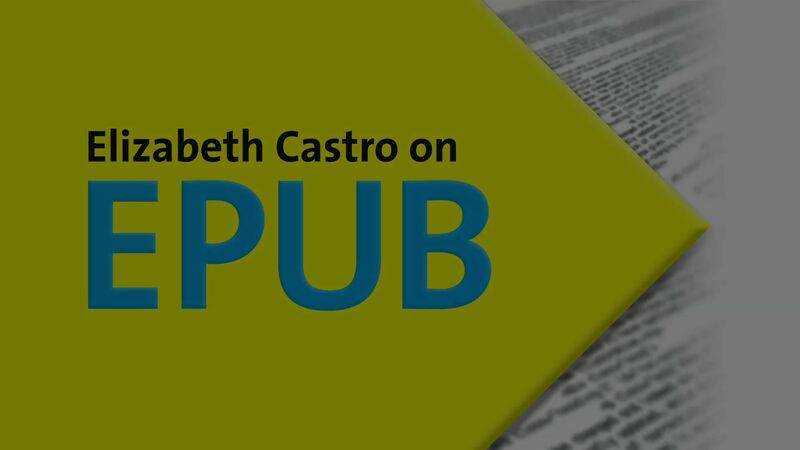 This video interview explores Elizabeth Castro’s EPUB workflow using InDesign and a text editor. Elizabeth explains that InDesign’s robust EPUB export features takes advantage of all the things you’ve already done for a print product. Although the exported EPUB file is a good start there are things that InDesign doesn’t do that well. She goes on to explain that by opening the file in a powerful text editor you can unzip the EPUB and see and edit the files. The video interview goes on to talk about best practices, fixed layouts, EPUB to MOBI (Kindle) conversion strategies, fonts, indexes, and testing EPUB/MOBI files.